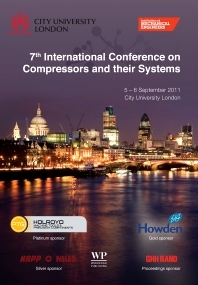 This book contains the papers presented at the 7th International Conference on Compressors and their Systems at City University London in conjunction with the IMECHE. This conference is the ultimate global forum for reviewing the latest developments and novel approaches in compressor research. It features contributions from equipment manufacturers, suppliers, users and research organisations; these papers present developments in air, gas and refrigeration compressors; vacuum pumps; expanders; and related systems and components. Papers cover the design, development and operation of a wide range of compressors and expanders. Equipment manufacturers, suppliers, users and research organisations are all represented. Aspects covered include: present and future developments in scroll compressors; design and optimisation of screw compressors; latest thinking in oscillating and vane compressors; improving the function of valves; latest research in dynamic compressors; detailed analysis of reciprocating compressors; improved accuracy and usefulness of modelling techniques; developing better control of centrifugal compressors; and reducing unwanted noise and vibration. Researchers, practitioners, managers and technicians with theoretical and practical interests in compressors and their systems.